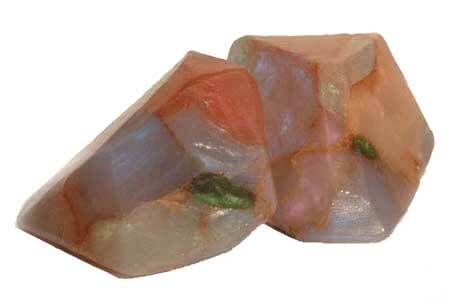 White Opal Soap Rocks...fiery iridescence, feel the magic of opals. White Opal Soap Rocks are made from unique blends of whole herb extracts, vitamins & minerals. Opal Soap Rocks are very mild & extra long-lasting. Soap Rocks are gentle for sensitive skin, contain no animal products, & are tested on humans. "In form & function Soap Rocks are dedicated to our skin, our spirit, & our earth." "Wake up with wonder! "...Soap Rocks are replicas of the earth's precious stones, made from mild, extra long-lasting vegetable glycerin soap. Like fresh air on different days, each variety has its own unique, light aroma. Several premium soap bases are required to bring such wonderful washing qualities to Soap Rocks. Up to 180 additional steps are necessary to recreate in each soap the beauty that takes nature millions of years!!! T. S. Pink White Opal Soap Rocks. Size: White Opal Soap Rocks have variations in size, shape & color. Each Soap Rock weighs approximately 6 oz.